Evan was so excited this morning to start Kindergarten!! I would love to talk with you about your journey with Evan. My son was diagnosed with Embryonal Rhabdo of the prostate one year ago at the age of 16 months. It is so difficult to find "experts" and other families with experiences with rhabdo. 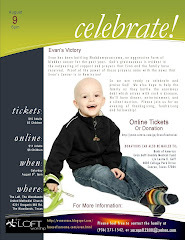 My son completed treatment (42 wks of VAC chemo and proton beam radiation) in September. Seeing the photos of your son marching into his first day of Kindergarten is inspirational to our family. I'd be interested in hearing more about your ability to manage Evan's pain (as my son is still healing from his biopsy six weeks ago and experiencing a lot of pain when he urinates). The doctors don't seem to know how long the healing process should take. I'd appreciate any information you'd be willing to share with me. I can be reached at shayne_anne_beecher@msn.com. Thank you! A HUGE thank you to the following individuals and companies that have donated to Evan's Celebration! Houston Skate and Dance - donation of "kids skate basket"